Centred around the poem I Love Lamp by Ford Dagenham, Many Hands Make Light Words is a community-created light installation, developed through a cross-continent collaboration between Light Collective and PhotoActivate. Wellington LUX is a free public light festival that turns the city’s waterfront and laneways into a captivating celebration of light, art, technology and design. 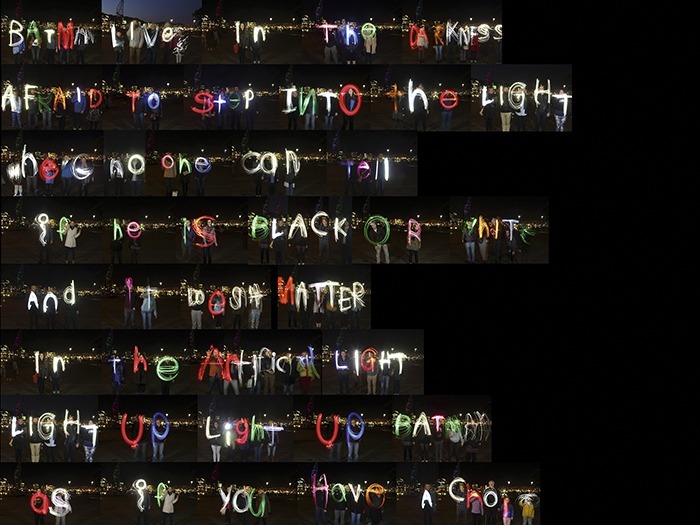 In August, the festival featured Many Hands Make Light Words: an installation that came about through a cross continent collaboration between Light Collective in the UK and PhotoActivate in New Zealand. Centred around a poem by UK poet Ford Dagenham, the first Many Hands Make Light Words is part of a series of community created light installations that will be taking place around the world and led by Light Collective. In Wellington, PhotoActivate and their dedicated team made the project come alive. Together, both teams invited Wellington LUX visitors to help create a piece of text about light using light, encouraging groups of passers by to each write a word in light writing. Each image was photographed and projected onto a building façade so that the participants could see their contribution magnified. Each word was combined together after the festival to create a huge image and a film containing all the photos and therefore all of the participants. This large scale community light art piece stands as a legacy of everyone’s involvement after the festival was concluded. People literally became part of the picture and by participating, an integral part of Wellington LUX. The poem I Love Lamp was created by maverick poet Ford Dagenham and features a huge number of quotes from popular and classical culture, including: the Rolling Stones, Prince, The Kinks, Gladiator, Velvet Underground, Led Zeppelin, Phillip Pullman, The Clash, Sonic Youth, Pink Floyd and many more. The festival showcased a fantastical array of high quality light sculptures that wound their way through an urban light trail within the city’s laneways and spilled out into a promenade of light installations along the waterfront. These were accompanied by talks from national and international artists, designers, and researchers; pop up exhibitions and installations; and free activities. LUX was also fortunate to showcase the work of leading practitioners including Ruari Glynn, Kimchi and Chips, Anti VJ, Visual System, Squidsoup, James Nizam, Nonotak, Kit Webster and HC Gilje. The next Many Hands Make Light Words will take place as part of the Aberdeen Light Festival Spectra in February 2016 and will feature the work of 250 school children.